India Art Festival is conducting it's 6th edition at Nehru Center, Mumbai, India from 06 to 09 October 2016. It is a 4 day art festival, where in the art collectors and artists will be able to interact and communicate directly. This opens a new set of doors for creations and innovations. IAF will be visited by leading art industry experts. IAF brings forth the importance of contemporary, modern and fine art in the new generation. Significance of this festival is to bring forth talented artists from the arts and crafts industry. This is the only art festival in India which brings in all artists, buyers, art galleries all under the same roof with a common interest. Every year IAF conducts two art festivals in Mumbai and Delhi. This year the Delhi art festival was conducted in January. The IAF started in 2011 and it's an interactive platform where educative seminars take place on subjects related to art. 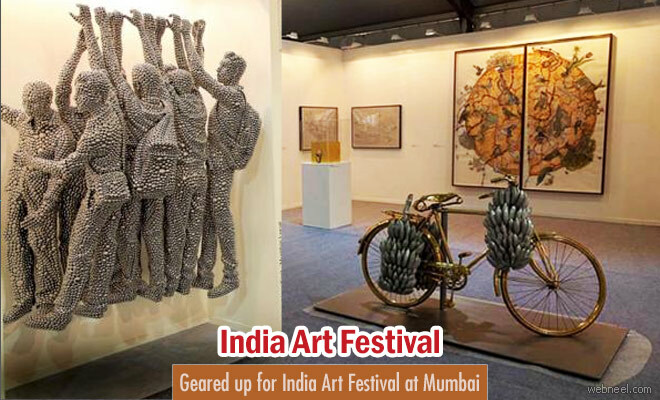 India Art Festival is an initiative of Kalavishkar, an organization that endeavors to democratize Indian Art through the initiatives such as India Art Festival and Indian Contemporary Art Journal, a quarterly magazine on visual arts.